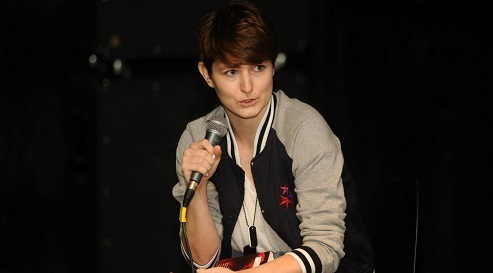 Asja Bakić (1982) is a Bosnian poet, writer and translator. She was born in Tuzla, where she obtained a degree in Bosnian language and literature. She has published a book of poetry, Može i kaktus, samo neka bode (It Can Be a Cactus, as Long as it Pricks, 2009), which was nominated for the Kiklop Award for best debut. Her second book, a collection of short stories entitled Mars (2015), was shortlisted for the Edo Budiša Award for young writers. Her poems and stories have been translated into English, Polish, Czech, Macedonian, Slovenian, Romanian and Swedish. She writes the blog In the Realm of Melancholy (asjaba.com) and is co-editor of the feminist webzine Muff (muf.com.hr). Bakić participates in the European poetry platform Versopolis. She has translated Emily Dickinson, Alejandra Pizarnik, Elizabeth Bishop, Emil Cioran, Jacques Rancière and other prominent authors into Croatian. She currently lives and works in Zagreb. Asja Bakić was selected as one of Literary Europe Live‘s New Voices from Europe 2017.